Refresh your workforce, guests and customers with a chilled cold drink. 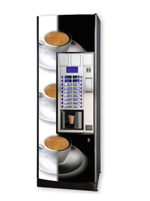 We offer a diverse range of vending machines from space saving models to high volume glass or close fronted. SA Vending’s partnership with IVMOA means we can offer a comprehensive range of branded drinks such as Coca-Cola, Schweppes, and Mt Aqua ensuring consumers always get an ice cold option every time. Vending machine technology has advanced to the point whereby you can now replace a staffed canteen with a snack vending machine, saving you massively on your catering budget! We have snack machines in all sizes to fit the various sizes of locations or to accommodate various numbers of staff. Have a cigarette vending machine or dispenser machine delivered to your premises. Machine will be fully stocked and maintained at no cost to you. Provide your venue with a hot beverage; our coffee machines are placed free of charge with no ongoing costs. Your staff and customers purchase the drinks themselves. Our employees are trained in technical repairs so the maintenance will be carried out regularly and repairs attended to at once. We will respond to your call within 24 hours and repair the problem as soon as possible. Provide a vending machine option for you staff or guests 24 hours a day, 7 days a week. Contact us today to find out about the latest vending machines, products and solutions. Copyright © 2019 Sydney’s Vending Solutions. All Rights Reserved.